← My bowl’s fuller than your bowl. I can’t switch off the dark lovely, I can’t switch off your imagination either. I can put a little light on for you, leave the door open too. There is a cat that rather likes to sleep on your bed who will keep you company. It’ll be light very soon. Posted on September 26, 2014, in Uncategorized and tagged Children, Doodlemum, Drawing, Family, Humour, Illustration, Life, Pen and Ink, Sketchbook. Bookmark the permalink. 6 Comments. Love this! I have been scared of the dark since I was little and I still sleep with a night light on. 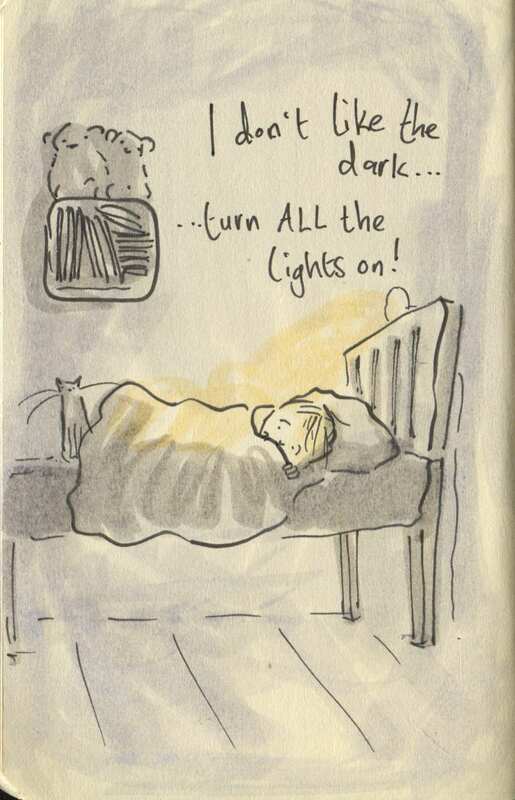 Don’t think it’s a fear I will ever get over – very cute, love your drawings! Thanks Wendy. He has stars, a lamp and plug in fairy lights! I think he was a very tired little boy yesterday. Oh dear! All that school and growing must be wearing him out! Has that wretched parcel turned up yet? I sent it to your agents 10 days ago, for them to forward on to you…. ho hum! You are very, very welcome, it was a tiny gesture to say a HUGE “thank you” to you for brightening my days. I’m just glad it’s FINALLY arrived- the mug set off to you in the summer holidays- it was starting to look like it would only arrive in time for Christmas! Sorry I have ( inadvertently) added to the scary eyes pile!